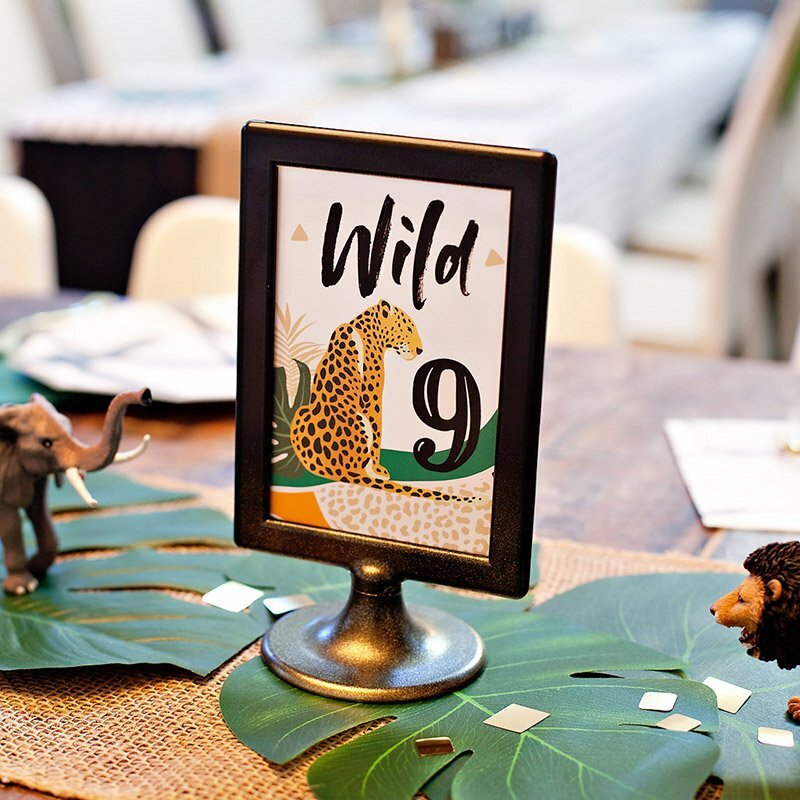 Party inspiration can come from anywhere, and Stefanie of The Petite Soiree found it in a classic nursery rhyme this time! 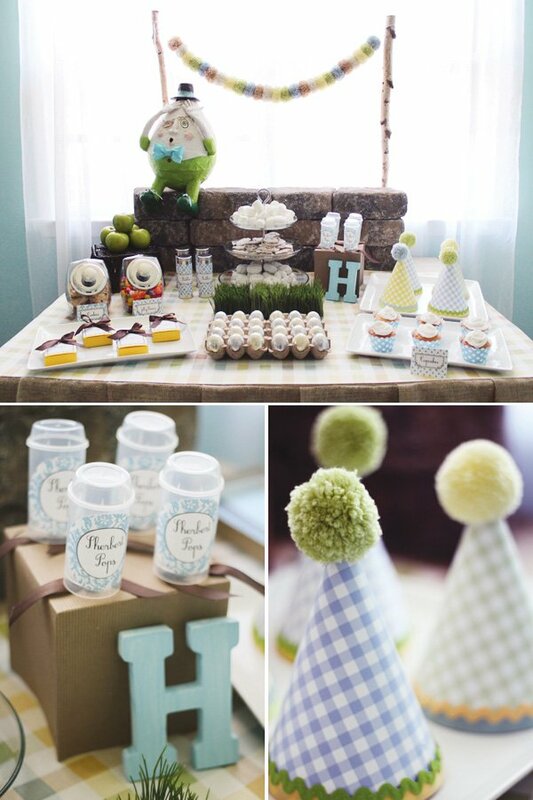 Her stylish take on a Humpty Dumpty Inspired Party is filled with great ideas for a charming – and wonderfully nostalgic! 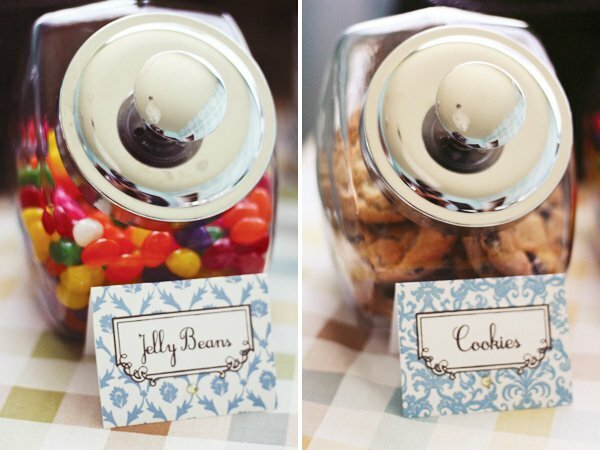 – baby shower or first birthday celebration. 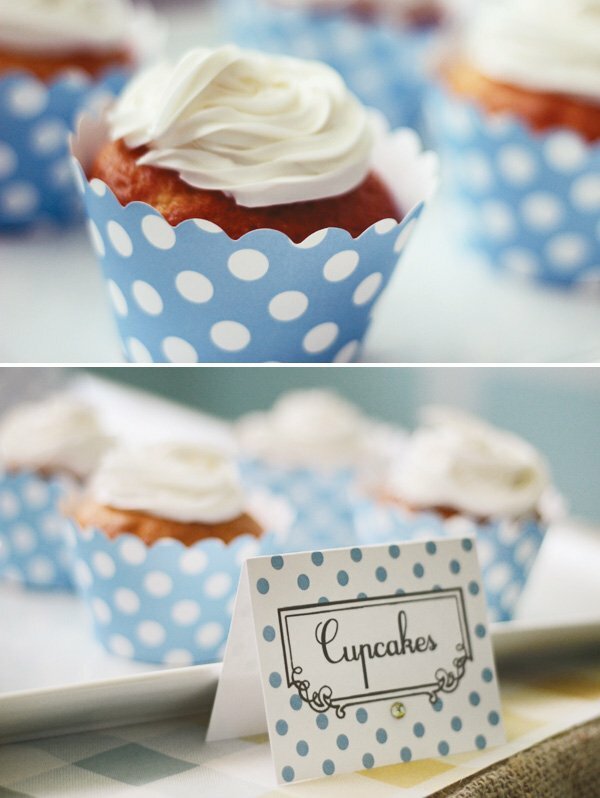 Silver eggs, sweet cupcakes, fluffy marshmallows & more simple treats! 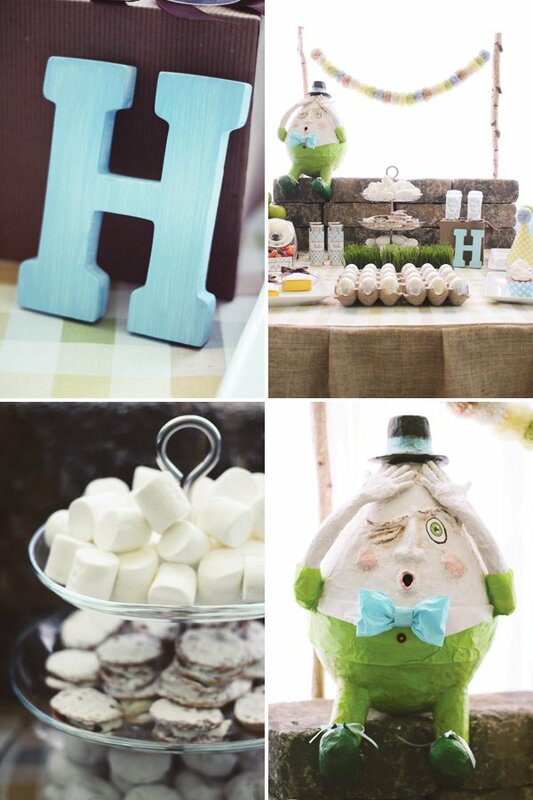 I was inspired to do a Humpty Dumpy party because I absolutely love the nursery rhyme and thought it would be a great theme for a baby shower or children’s birthday party. 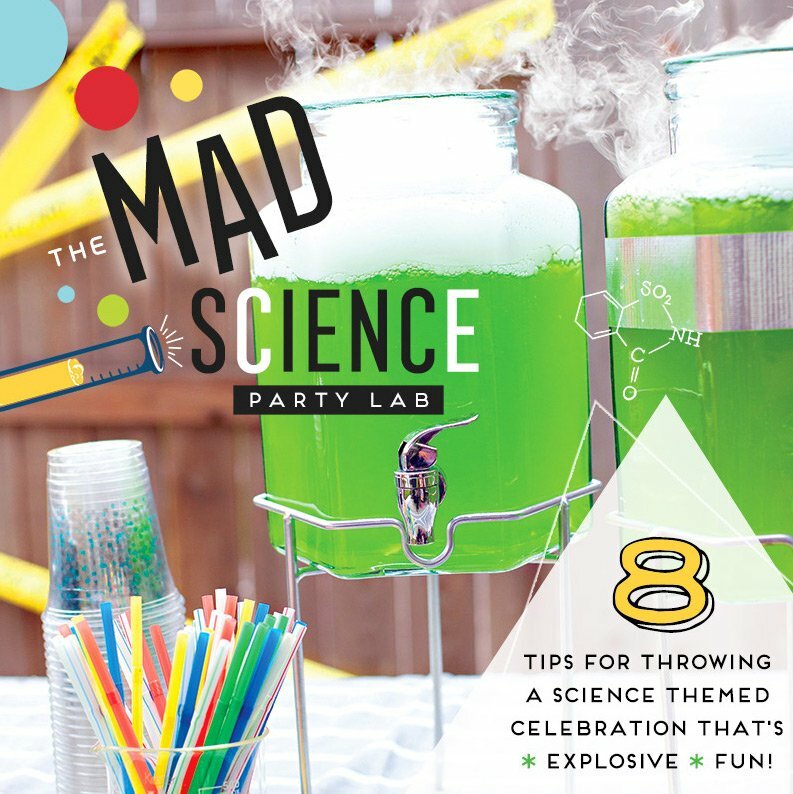 I really wanted to take an untraditional, yet chic approach to the party design. 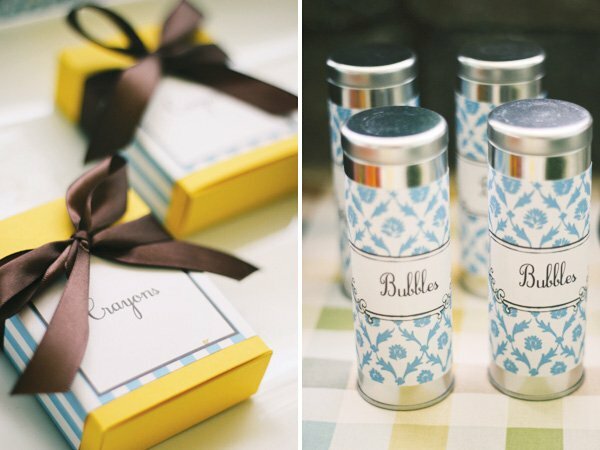 I chose to do a grass green, baby blue, teal, yellow and creme color scheme for the party, in hopes of keeping it fresh and airy. 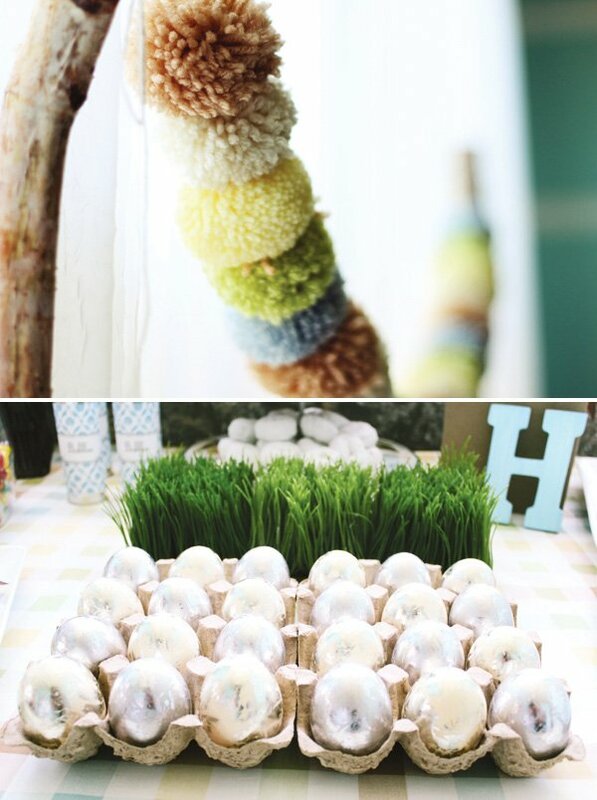 I used a natural burlap tablecloth and yarn elements like the pom pom garland and hats – to keep the feel very warm and tender similar to the elements in a baby’s nursery. Pavers created the wall and many of the elements like the life sized humpty that can be repurposed into a child’s room or nursery so that the theme can live on everyday for the child. 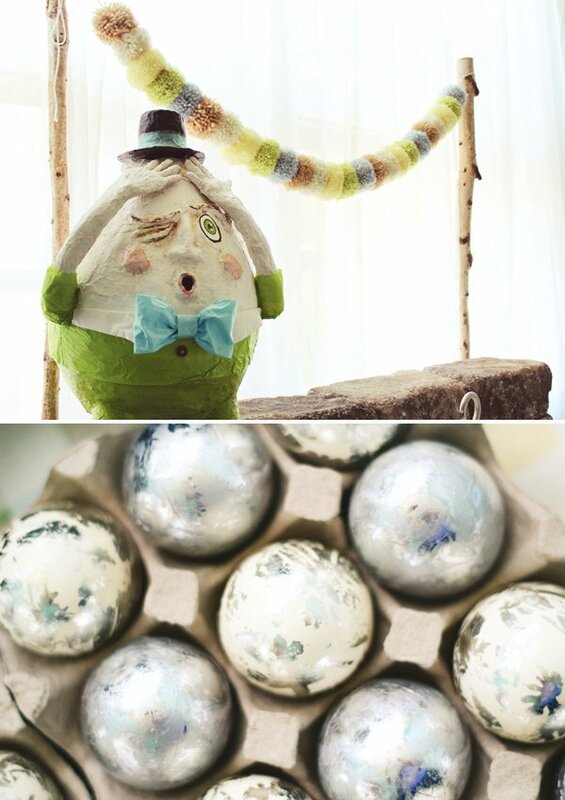 My biggest challenge was creating a life sized humpty dumpty that could sit on the wall for this party. 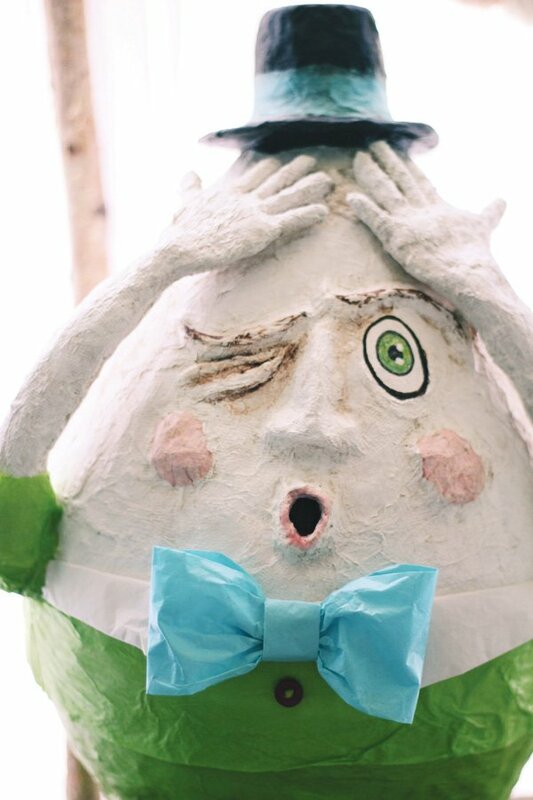 Originally a local sculptor created a matching humpty out of ceramic but unfortunately it shattered in the kiln. I was very happy to have found an artisan who was able to create this twin version out of paper mache in the matching colors. Oh so cute! Love the yarn pom garland! VERY cute. Love it. So creative. 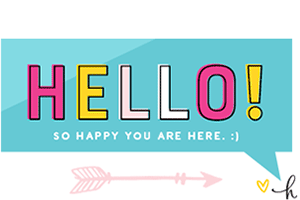 *One thing though that immediately caught my eye – sherbet is misspelled! Hahaha d’oh! Love this! 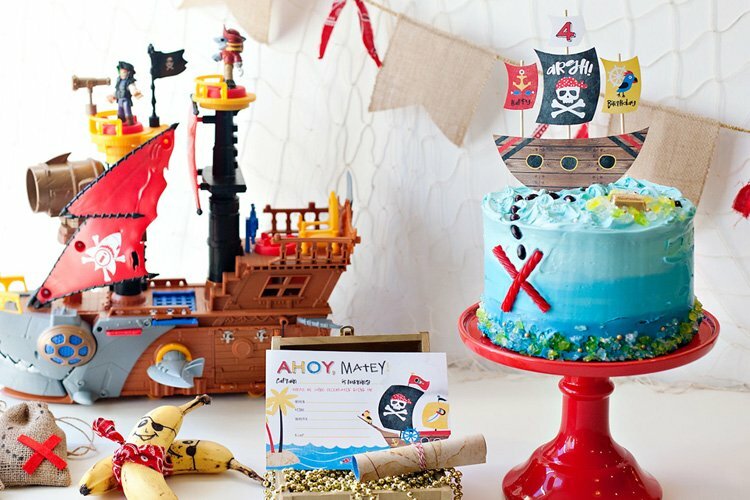 Such a fun theme and the colors texture and details are fabulous!! What a lovely party! 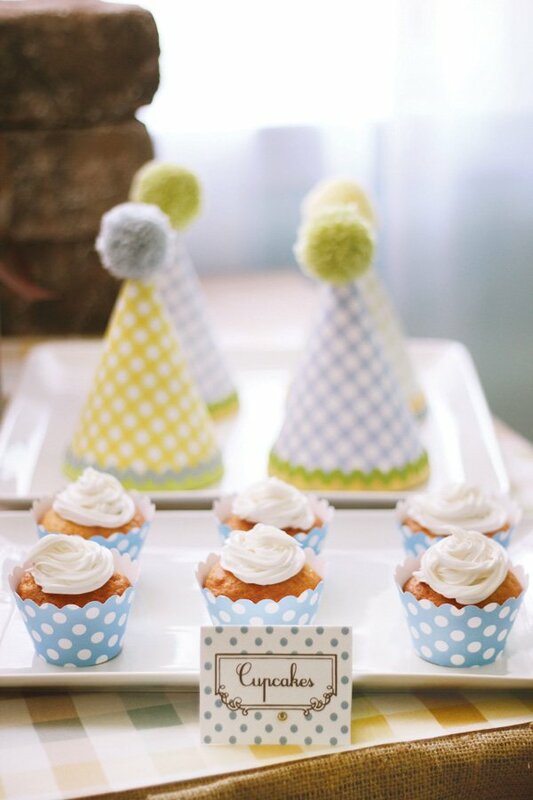 Super unique theme and am just loving the yarn pom garland and party hats, not to mention the silver eggs! LOVE! Pls. 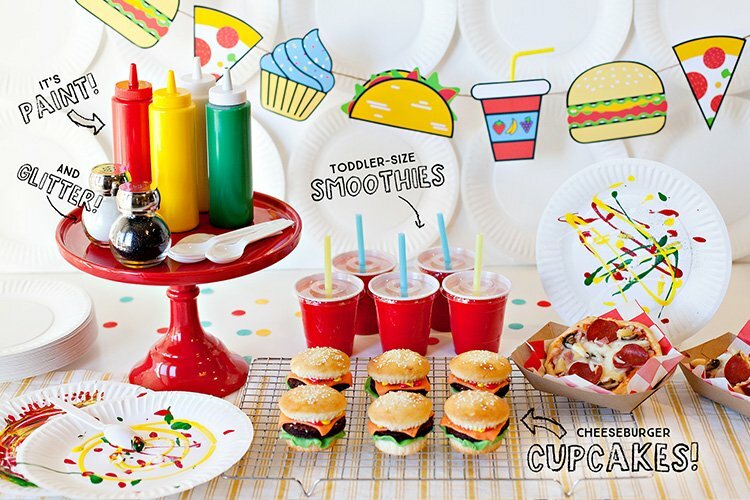 tell me where I may purchase the table cloth?